I am a big fan of mixing sweet and savory items, particularly when the savory item is also spicy. 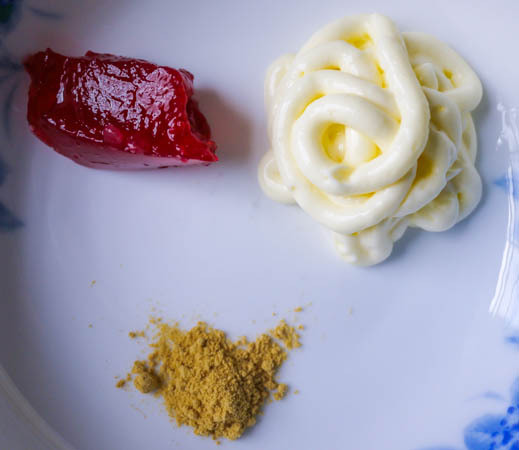 The creaminess of the mayonnaise, the sweetness of the strawberries, and the earthiness of the ginger make this condiment a well-rounded counterpart to any spicy meat. Particularly my Jerk Pork Tenderloin! It cools off the spiciness of the meat and gives the flavors an extra dimension. It’s also dead easy. If you don’t like strawberries, you can swap it out for any other preserves, like apricot or grape. Don’t like mayo? Swap it out for sour cream. Hate ginger? Use tarragon! Or chives! Or a good mustard! It’s very customizable. The general principle is something sweet + something creamy + something earthy. Kissel’s Spiced Jams does an excellent job of pairing sweet and earthy and you can look to them for flavor combination ideas, such as Apricot & Rosemary, Peach & Coriander, Cherry & Fennel, and Plum & Tarragon. The uses for this mayo are endless. Get a half a pound of Boars Head Jerk Turkey and Chipotle Gouda from the supermarket deli. 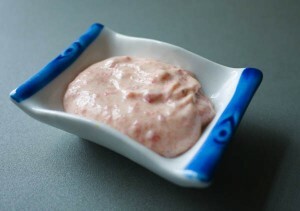 Lay out a piece of turkey, spread on some strawberry ginger mayo, top with a piece of cheese, and roll it up like a cigar. Keep going until you run out of turkey and store in a Tupperware container in the fridge for easy snacking. Mix all ingredients well and serve. On weekends and at any other time of the day, it’s a different story, but during the week after work, I lose all motivation to cook. Except for recipes like this one. It only takes a few minutes to assemble and then roasts in the oven undisturbed while you can change into comfy clothes, check the mail, and just generally de-stress. It was originally a side dish created by Ina Garten (who I love!) and adapted by Simply Recipes, and I further adapted it by adding meat to make it a complete dinner. It has a very rich flavor from the roasted cauliflower and the lemon, cheese, and spices combine into something that almost tastes like a super light alfredo sauce. As soon as you walk through the door, preheat your oven to 400F. Get out a baking sheet and line it with foil, so that clean-up will be super easy. 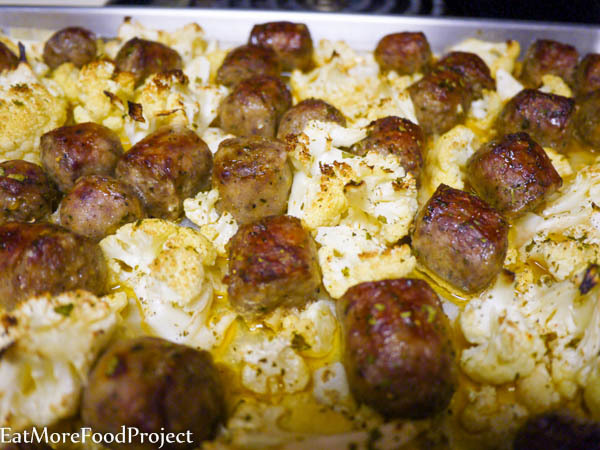 Cut the cauliflower into small florets and put them in a single layer on the baking sheet. 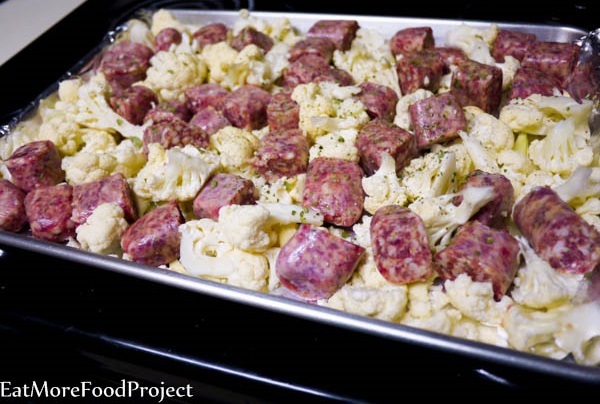 Toss in your garlic, olive oil, salt, pepper, parsley, lemon juice, and sausage pieces. Use your hands to mix the ingredients until each piece is coated with a bit of olive oil. Place it all in the hot oven for 40 minutes, uncovered. 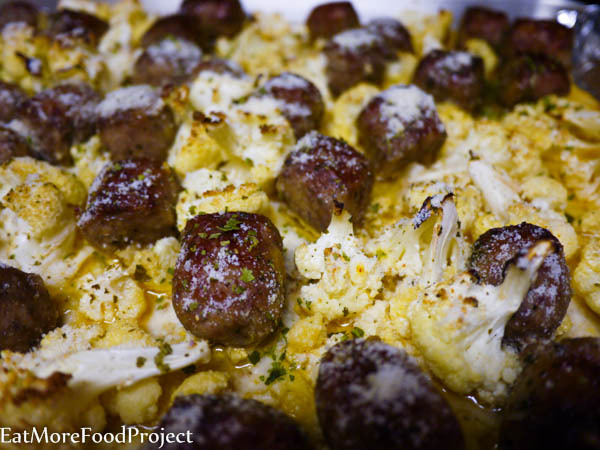 The top should be lightly brown and the cauliflower should be easily pierced with a fork. Remove from the oven, sprinkle generously with Parmesan cheese and serve. Roasted cauliflower and Italian sausage with a light sauce of lemon juice, olive oil, garlic, spices, and Parmesan cheese. When my husband and I first started living together, I had never seen him cook before. I knew that he could cook well enough to keep himself alive, but I’d never seen the process. One day I was making dinner and I asked him to season some chicken drumsticks in a bowl on the counter. “With what?” he said. “Salt, pepper, garlic powder, and onion powder! Isn’t this what everyone seasons raw chicken with all the time?? What the heck are we really talking about here?! ?” I thought. I was thoroughly confused when I looked over and saw him very lightly shaking the seasonings over the bowl and then stepping away. In my family, we season food aggressively. Not just in the amount, but in the way we physically do it. Meat isn’t “seasoned” unless it has been slapped around in the bowl, crushed into neighboring pieces, and massaged above and below the skin. I don’t know if it’s a Caribbean thing or just my family, but I can’t season my meat any other way. This is one of those recipes where you really need to aggressively season the meat for the dish to come alive. There are so few ingredients, so you really need to rub everything against each other for the flavors to meld. 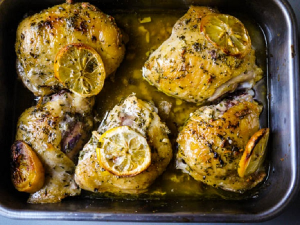 Preheat your oven to 375 degrees F. Season your chicken thighs with olive oil, salt, pepper, garlic powder, onion powder, and Fines Herbes seasoning. 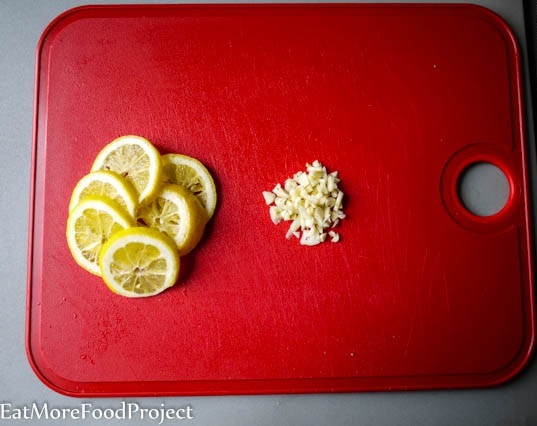 Thinly slice your lemon and mince your garlic. Aggressively season the chicken in a baking dish. Bake for 1 hour and serve. Chicken thighs baked with a simple sauce of lemon slices, heaps of garlic, and fine seasonings. Low carb, paleo, and gluten free! 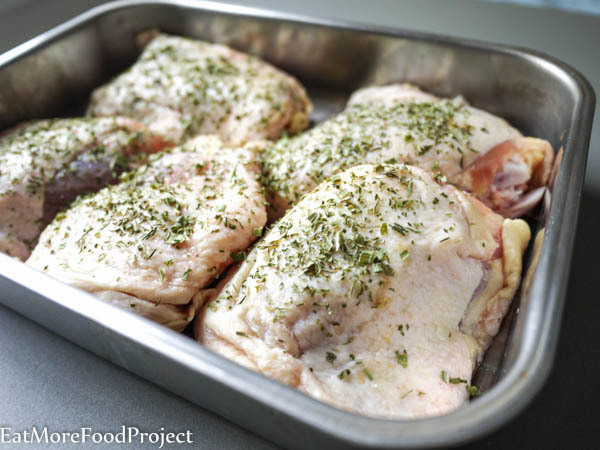 Season your chicken thighs with olive oil, salt, pepper, garlic powder, onion powder, and Fines Herbes seasoning. I have vivid memories of sitting down at the dinner table as a little kid and seeing my father sweating profusely, dabbing his nose, and guzzling water because the food was so spicy. He would cook the meat with a scotch bonnet pepper sitting fully intact at the side of pot. Once the kids’ shares had been dished out, he would pierce the pepper with a knife and stir it around and take the dish from 1 to 100 on a spice level. As I sat there watching him, I wondered why anybody would put themselves through that. It hardly looked enjoyable. Now that I’m an adult, I get it. Sometimes you just want that kicked-up, make-your-toes-curl flavor and you don’t care if you sweat through a suit jacket to get it. 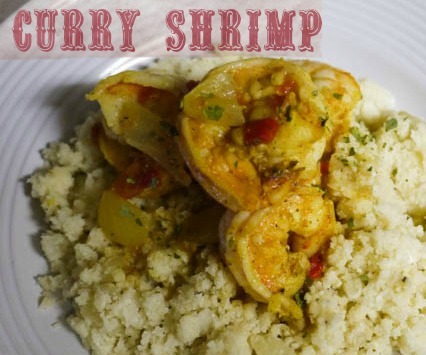 I got this recipe from That’s So Yummy’s Jamaican Curry Shrimp and slightly adapted it to fit the ingredients I had on hand and take the heat up a few notches. I don’t eat this because I’m allergic to shrimp (though I did sneak a small bite! ), but my husband says it was out-of-this-world good. Chop up your garlic, onion, tomatoes, peppers, scallion, and scotch bonnet. 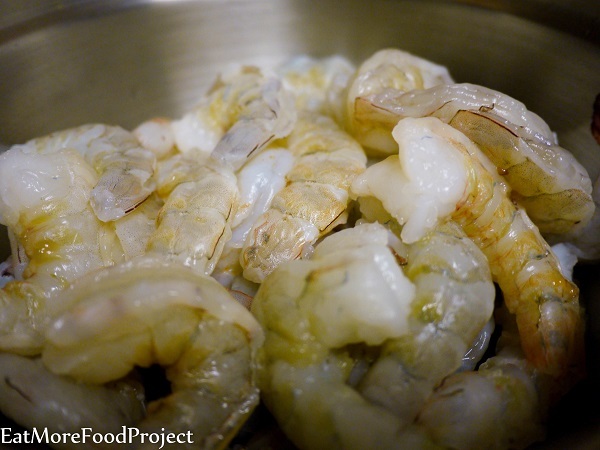 Peel and remove the vein from the shrimp. 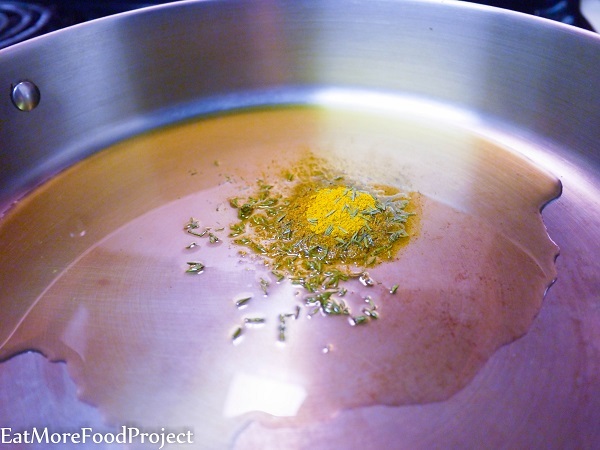 In a large skillet, add olive oil, curry powder, and fresh thyme. Cook on medium heat for approximately 1 minute, until the curry powder becomes very fragrant. Add the tomatoes, scallion, roasted red pepper, onion, salt, pepper, and garlic. Sauté for 5 minutes, stirring frequently so all the ingredients are coated in the curry oil. Add water and bring to a boil. Reduce heat back down to medium and toss in your shrimp. Stir the shrimp into the mixture and let simmer on medium heat for 10 minutes or so, until the shrimp is cooked and no longer opaque. I served this on a bed of cauliflower couscous. 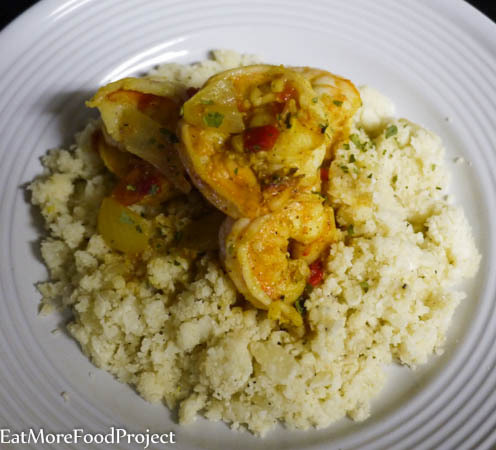 Quick and spicy Jamaican curry shrimp with tomatoes, onions, garlic, and scotch bonnet pepper. 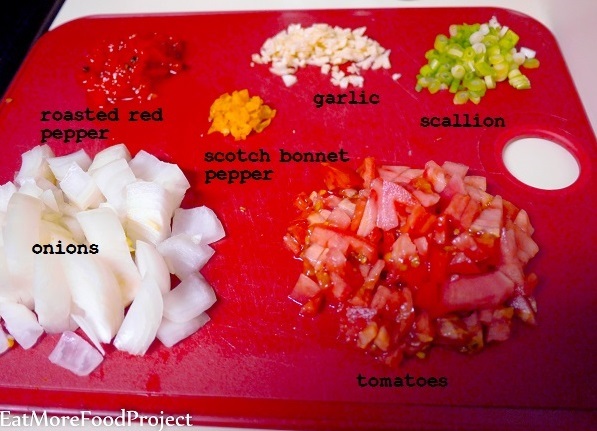 Chop your onion, tomato, pepper, scallion, garlic, and scotch bonnet pepper. Cook on medium heat for approximately 1 minute, until the curry powder becomes very fragrant. 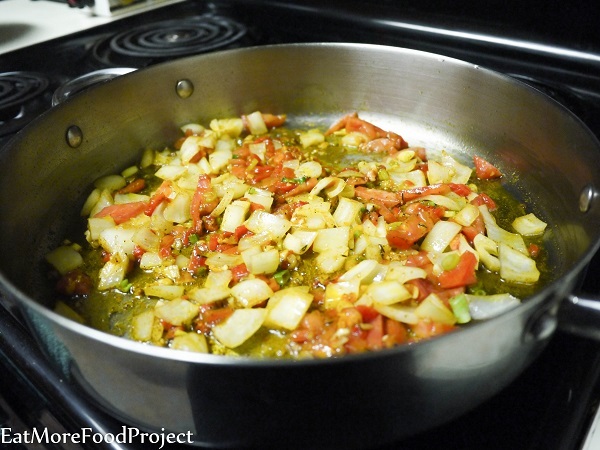 Add the tomatoes, roasted red pepper, onions, scallion, salt, pepper, garlic, and thyme. Sauté for 5 minutes, stirring frequently so all the ingredients are coated in the curry oil. Reduce heat back down to medium and toss in your shrimp. 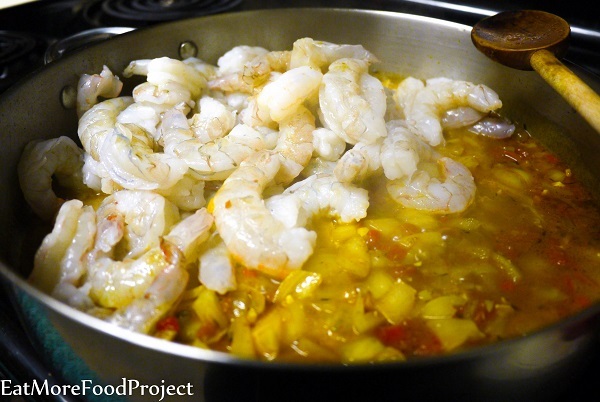 Stir the shrimp into the mixture and let simmer on medium heat for 10 minutes or so, until the shrimp is cooked and no longer opaque. When I was in law school, I was one of the managing editors of our law review. Part of this job entailed waking up obscenely early in the morning on weekends and editing articles line by line in the basement of the library. One of the best parts of this job (other than the excellent company… hi Nicole! hi Mike!) was that we’d usually stuff ourselves with fresh bagels slathered with Boursin cream cheese. 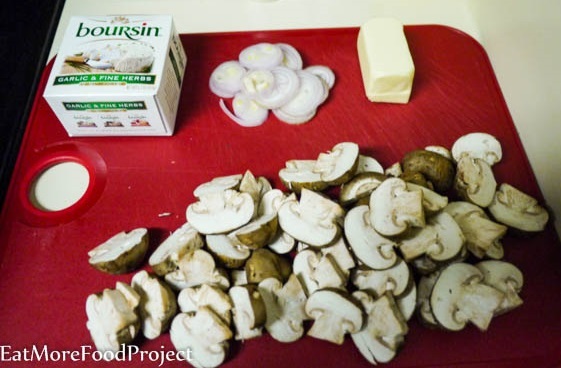 I had never heard of Boursin cheese before then and I developed an obsession with the stuff. It has a soft, crumbly texture like goat cheese, but it tastes like scallion cream cheese. Only much lighter. The other day I was craving some and, as I’m staying away from bagels at the moment, I searched around for a suitable recipe. 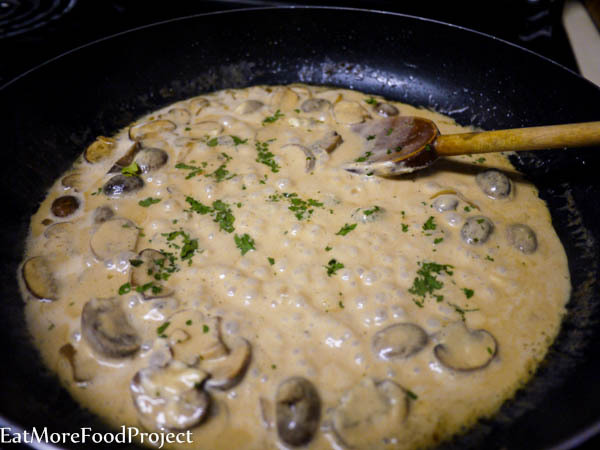 This one is slightly adapted from Baked Bree’s Chicken with Boursin Mushroom Sauce and it is absolutely heavenly. The velvety sauce would be good on anything, but it really shines against juicy chicken breasts. 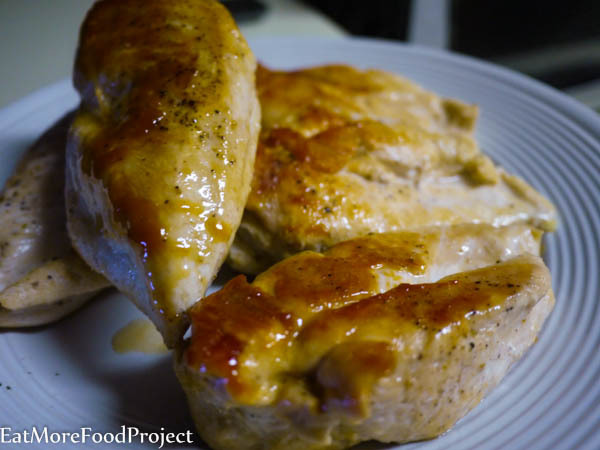 Season chicken breasts with salt and pepper on both sides. 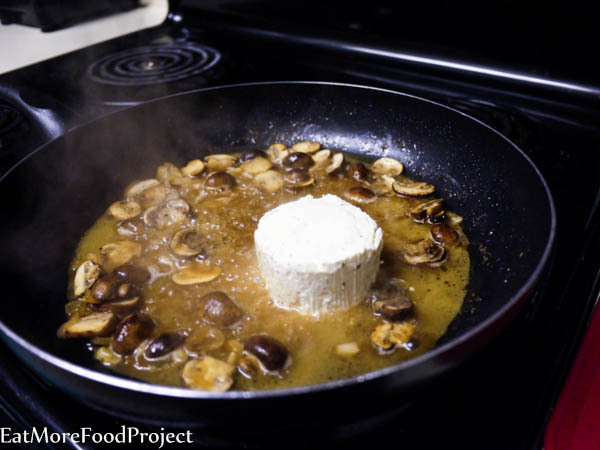 Slice your shallot and mushrooms and set aside your Boursin cheese and butter. Add extra virgin olive oil to a large skillet and cook the chicken breasts on high heat for 5 minutes. 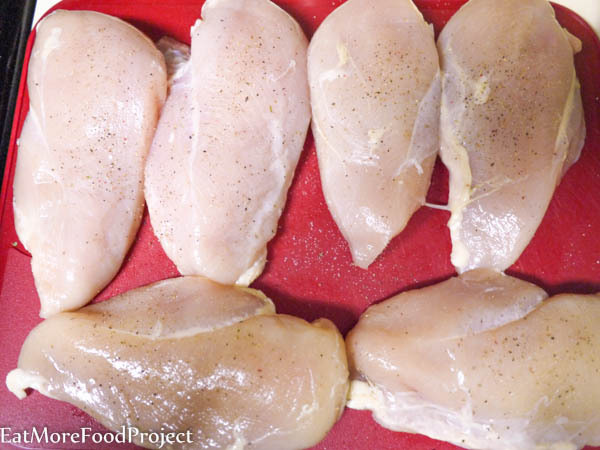 Flip the chicken breasts over, reduce heat to medium, cover and cook for an additional 15 minutes. The chicken should be fully cooked at this point. Remove chicken from the skillet, put on a plate, and cover with foil to keep warm. 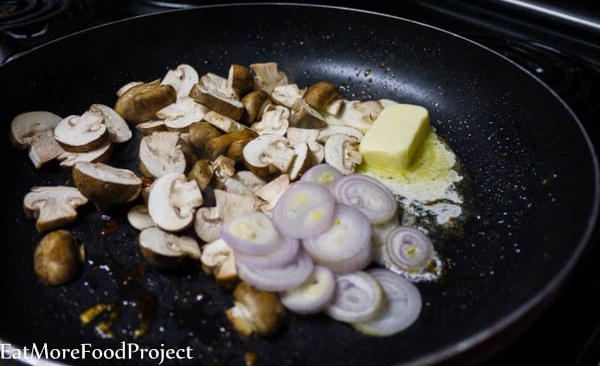 Add the mushrooms, butter, and shallots to the same skillet the chicken breasts were in. 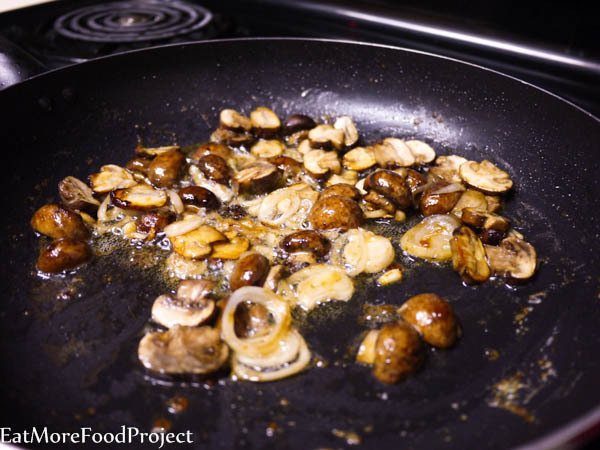 Cook for about 5 minutes, until the mushrooms are golden brown. Add the wine and cook until the wine has reduced by half. Turn the heat to low and add the Boursin cheese and parsley. Stir until the cheese has melted. 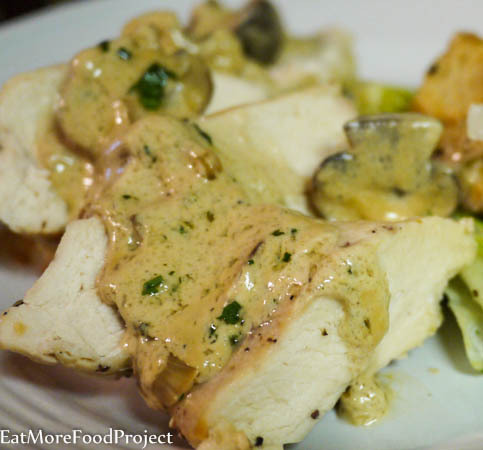 Slice your chicken breasts into strips and drizzle with the Boursin mushroom sauce. Add extra virgin olive oil to a large skillet and cook the chicken breasts on high heat for 5 minutes. 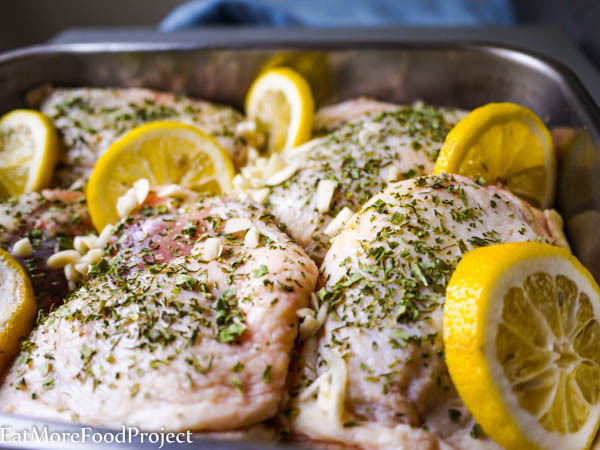 Flip the chicken breasts over, reduce heat to medium, cover and cook for an additional 15 minutes. The chicken should be fully cooked at this point. Remove chicken from the skillet, put on a plate, and cover with foil to keep warm. Add the wine and cook until the wine has reduced by half. Turn the heat to low and add the Boursin cheese and parsley.